When you start to meditate, one of the questions you often ask yourself is “Am I doing this right?” or “Is this how I am supposed to focus my mind?”. We usually have no means to know. Even if we have a meditation teacher and try to explain what is happening inside ourselves, our internal world is so subtle (if not messy) that it is hard to accurately explain our experience. On the past decades, scientists have studied the effects of meditation on the brain using EEGs and fMRIs scans, but this was limited to labs and hospitals – these machines were too big and expensive for personal use. Now this has changed, and we have a luxury that previous generations of practitioners did not have – a portable, easy to use, meditator-friendly EEG headband. Muse has been around for a while – they got funded in IndieGogo late 2012 – and they have been featured in TechCrunch, Mashable, CNN, BBC, Huffington Post, the Discovery Channel, and some universities. You can learn more about the benefits of using it and the backing research in the official website. The product is gentle on the skin, and the design is stylish and minimalistic. When meditating with it, in the beginning I was distracted by being aware of its presence on my head, but by time I got used to it. I liked how well it fits on the head, and that it can be adjusted to different head shapes and sizes. Muse has 7 sensors, and collects data in 4 channels. It comes with a regular micro-USB cable, and a simple, 10 pages “getting started” manual. The battery lasts for up to 5 hours of use – so if you meditate 20 minutes per day, that is nearly 2 weeks of battery life! Muse has been tested and certified in accordance with Canadian, USA and European regulatory standards (FCC, UL, CE). It can be used by individuals of 16 years of age or older. For the nerds: these are the technical specs. And yeah, they also have an SDK! The device needs to be paired, via bluetooth, with your smartphone or tablet. Both iOS (version 6.1 and above) and Android (version 4.0 and newer) are supported. Check device compatibility list here. This pairing needs to be done only once. Next step it to download the Calm app, go through the instructional videos, and calibrate your device, so it has a baseline of how your brain functions. Now you are all set to go, and can start doing the focused attention meditation, guided by the app. It supports multi-user login, and has meditation sessions ranging from three to twenty minutes. 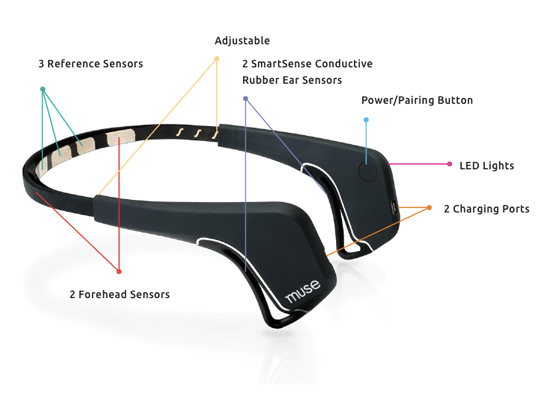 Muse gives you feedback about your brain in real-time by translating your brain signals into wind sounds. When your mind is calm and settled, you hear calm winds. When your mind is active the winds will pick up and blow. Learning to keep the winds calm trains your brain to stay focused and resist distractions. When you’re able to quiet the wind sounds for long periods, then birds sounds will appear. That your mind is calm. Depending on the Difficulty Level you selected, the auditory feedback will fluctuate more or less rapidly. This doesn’t affect, though, how the score or number of birds is calculated. The app also calculates “points” for your meditation. You receive 1 point for every second that your brain is in a neutral state and 3 points for every second that your mind is calm. After 5,000 points you unlock more stats: “timeline view” and “insights about you” (which tells you things such as what time of the day your sessions are calmer or when you “earn more birds”). The device is highly sensitive, so if you move your head or yawn, the signals get a bit noisy for a few seconds. Brain signals are very weak and they can range from 1 microvolt to 300 microvolts (a microvolt is one millionth of a volt). To put it in perspective, an AA battery is 1.5 million times stronger than the weakest brain signal. After the initial setup, the device and the app can also be used offline, which is handy! Learn more about the setup and usage in the official website. The neurons in our brain communicate by sending small electric impulses to each other. When a large number of neurons fire at the same time they create a change in the electric field, and that can be measured from outside the head. When neurons fire, we can calculate the strength of certain frequencies and correlate to general states of mind. That is how Muse is able to measure our brain waves. Delta waves (0.1 – 3.9 Hz) are most present during deep, dreamless sleep. Tibetan monks who have meditated for decades have been observed to arrive at this state while in an alert, wakened phase. Theta waves (4 – 7.9 Hz) are associated with sleep, very deep relaxation, hypnosis and visualization. Here, the verbal/thinking mind transitions to the meditative/visual mind. We begin to move from the planning mind to a deeper state of awareness, and wholeness. Alpha waves (8 – 13.9 Hz) occur when relaxed and calm. We often find ourselves in an “alpha state” after a yoga class, a walk in the woods, a pleasurable sexual encounter or during any activity that helps relax the body and mind. We are lucid, reflective, have a slightly diffused awareness. The hemispheres of the brain are more balanced (neural integration). Beta waves (14 – 30 Hz) is our waking state dominant waves, present when engaged in an activity, thinking, or talking. Beta State is associated with the alert mind state of the prefrontal cortex. This is a state of the “working” or “thinking mind”: analyzing, planning, assessing and categorizing. Gamma waves (31 Hz+) occur when involved in higher mental activity, insight, and intense consolidation of information. To my amusement, the device is really accurate – the brain waves in the graphs represented well what was going on in my mind. On my first session, lasting three minutes, I went into meditation as usual. My mind was very quiet, and the device showed 88% calmness, and 25 birds collected. After some trials, I got a couple of 98% calms (see images below). I realized that when I forget all about the app, and just do my normal meditation, it goes deeper. For beginner meditators, however, perhaps closely following the app feedback would be more beneficial. Calibrating the device was not easy in the beginning. It took some attempts until I realized the best way to place it on my head, and how to adjust the sides of it. My wife, on the other hand, could easily calibrate it every time. After the first 2~3 times, I could also calibrate it without an issue. Option to see raw data (wave signals), instead of only the weather and sound. This is probably only relevant for people doing meditation for longer, and I’ve read that it is possible to get this data by installing the Muse SDK and syncing your headband with your computer. Ability to set a timer for any length of time (currently the app allows for 3, 7, 12, or 20 minutes). In longer sessions, sometimes the connection drops, and doesn’t pick up by itself. When that happens I need to open my eyes and tap the screen. It is rare, but can happen. The app absolutely needs a feature to add notes to sessions, and later read them in form of a journal. This would be super useful. The gamification elements (charts, points, and medals) can be positively addictive, and make the experience of starting to meditate more interesting. It helps to create a positive sense of competition with yourself, and intensify the practice. Don’t go overboard with the competition feelings, though. I noticed that when using the Muse, if I was having the “performance mindset”, my meditation would be less calm than if I simply forgot about the device and dived into my practice. Likewise, doing the meditation while looking at the screen proved less efficient than doing it with eyes closed. By time we get use to it, so it easily integrates in our practice, without the feedback being a distraction. The screenshots below are of my experimentations with different techniques of meditation. The sessions are in the order that I tried, one after another, and they were 3 minutes long each. The first screenshot is simply a measurement of me thinking lightly about certain subjects, just to have it as a baseline. The ones that worked best for me are the technique I have practiced the most: mindfulness of breathing (in the form of Zazen) and I Am meditation. This one went the deepest. I’ll continue to use it to experiment with different ways of doing meditation, and to monitor my mental states during other activities, such as reading and answering emails. For now, I can say that I am happy and engaged with this tool. I spent some time reading user reviews about the product on Amazon. There were 112 reviews, mostly positive (including one from a neuroscientist, author of the book How God Changes Your Brain). With an average of 4 stars, I feel even more confident to recommend the Muse to you. There were people saying that they had tried meditation before and failed to continue with the practice, but could develop a habit through Muse. Or that it has helped them manage anxiety or ADHD. Others mentioned that they now sleep better, are less tense and less irritated during the day. One user called Muse “The Monkey Mind Alarm”, which I find quite befitting. Make sure your skin is fairly clean. Excess of skin oil, makeup or moisturizers can interfere with signal quality. Keep your head and face muscles as still as possible (just like you would during meditation). Try different heights on your forehead, and adjust the device’s rubber ear sensors, until you get good signal. After each adjustment, wait a second or two, so the sensors catch up with the changes. During the calibration exercise, actively work on the exercises given by the app. It will ask you to think about a list of things in a certain category, so make sure you put in some mental effort to actually think as many items as you can. Otherwise, the device won’t be able to differentiate your alpha and beta waves and the feedback the ir gives you during your meditation will not be the best. That’s basically it. After setting up for the first time, the device is basically good to go for all future sessions, and calibration will be quick and painless. As to the Bluetooth connection issues, if you paired the Muse with more than one device, you might need to turn off the Bluetooth from your previous device while connecting to a new one, otherwise the previous one, if it is in range, picks up the connection. This happened to me; but I’ve experienced this issue with several Bluetooth devices. Lastly, I also saw that sometimes after the connection is established, the app still doesn’t pick it up; in this case, killing the app and relaunching it fixes it. Muse is a great tool to help beginner and intermediate meditators have some real feedback on their practice, generate more interest in meditation, and build the habit. The gamification elements (charts, points, and medals) can also help motivate one to create the daily habit of practice. For more advanced meditators, the value of the product is really into having clearer insight into different mental states and meditation techniques. Finally, if you are a meditation teacher or mindfulness coach, this device can be a powerful tool for helping your students understand their progress and states. You can buy a Muse at ChooseMuse.com. It costs 299 USD, and international shipping is available. They have one year warranty and a 30 days money back guaranteed, so in any case it’s worth the try. It can also easily be shared with other people. Considering that a professional neurofeedback device would cost well over a thousand dollars, I would say that Muse is pretty affordable. I really like the product, and I’m confident it can be beneficial to many meditators, especially beginner and intermediate practitioners. For these reasons I chose to become their affiliate. If you buy through the link above, I make an affiliate commission (the price you pay is the same), which helps me support this site. Please leave a comment. Do you think Muse would be helpful for your meditation? Or do you own one? I would love to hear your thoughts.